What a race! 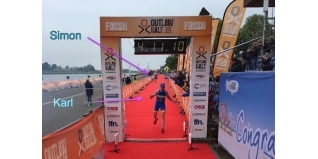 I've tried to summarise the fantastic men's race at the fifth edition of the Outlaw Half Triathlon on Sunday in my report from Nottingham HERE. While I hope that will give you some insight into another great event, it was really the entrée to the main event; the race report from the winner himself, Karl Alexander. 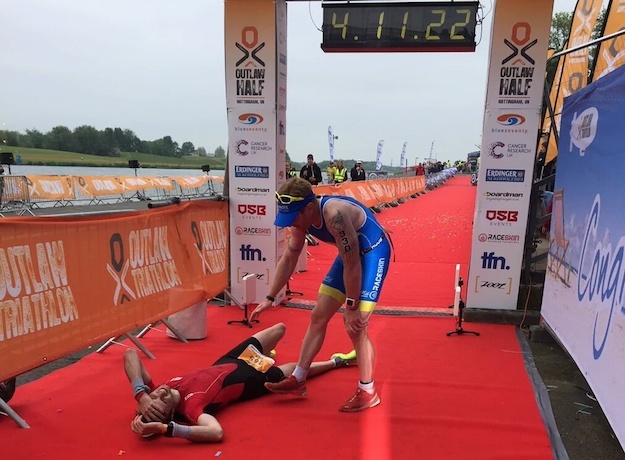 Read on to get the inside story from the perspective of the athlete who won the race without taking the lead until well into the 'point three' of this 70.3 mile distance event. Timing is everything... but eight seconds really is cutting it fine! 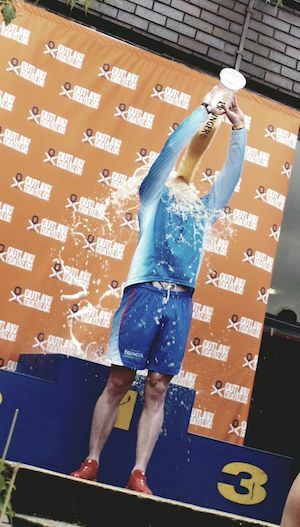 The Outlaw Half was my first major objective for my season. 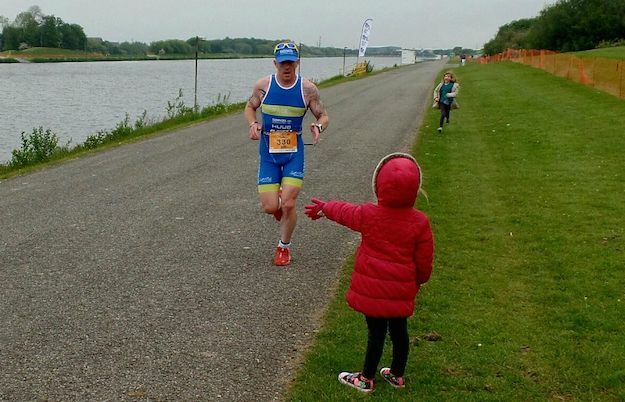 Having raced the National Standard Championships a few weeks previously and picking up an unexpected bronze medal in my 35-39 age group, I knew my form was coming good and was I looking forward to racing rested. There was a great buzz in the build up to the event, with some notable names racing including Joel Jameson (2011 Outlaw Champion) and Matt Bottrill, British Time Trialling Royalty. One name had been flying under the radar, but I knew he would be a factor after narrowly missing the podium last year; Simon George would be a major threat with a score to settle. Whilst waiting for a race briefing on Saturday, after I'd registered I spotted Joel Jameson and we sat next to one another whilst Iain Hamilton (Race Director) delivered his briefing. When he spotted the two of us sat next to one another he gave a wry smile and threw some questions out to us, my personal favourite was warning about a speed bump on the way into T2 that I crashed on last year! At 06:30 the klaxon sounded and it was go time. The first few hundred metres were a melee of hands and feet. I drifted off course (deliberately) to get some clear water and when moved back in as the first turn approached. In doing so I came into contact with two swimmers who were going well so I sat in with them. Whilst sighting I was trying to gauge my position and figured I was in the top 10. As I exited the water, the editor of a well known website (!) shouted that there were a few ahead, mostly relay athletes. I headed out onto the bike and started to pick off the athletes ahead of me, with one notable exception. Last year I caught Simon on the climb of Oxton Bank... over the top this year he was nowhere to be seen. I pressed on riding on the edge of my limit and began to wonder if there was anyone ahead of me until a marshall shouted ‘third place mate, a relay and a single I think'. A single… it had to be Simon. As I dismounted into T2 I became aware that someone had joined me, it was Matt Bottrill who'd had a simply storming ride completing the bike course in 2 hours 10 minutes. We left transition more or less together and I wanted to distance him quickly. Knowing the course I began pressing hard on the out section along the Trent tow path, but with it being a strong tailwind I eased up knowing that there would be a better opportunity to both close and open gaps into the headwind on the return. My plan worked and the gap was to Matt was opening, however the gap to Simon wasn't closing. As I headed onto the lake perimeter road the luminous jacket of his outrider was a speck in the distance but I was feeling good and was running well. A bystander gave me a gap, 4:15. At the speed we were running he was just over 1km ahead and I was feeling like the race was over, but coming down the lake to start the second and final lap I definitely felt the luminous jacket was getting a little bit bigger and as I passed the start/finish the gap was 3:45 so in 4km I'd only taken back 30 seconds. With 10km to run I had to close 3:45, I was running as hard as I could pushing myself and overtaking runners on their first lap. Approaching the turn I passed the point that Simon and I had crossed on the first lap; I was still gaining but the road was running out. I decided to go all in, it came down to a sufferfest. Back out onto the lake and not only was the luminous jacket in sight but I could see Simon in full technicolour (this could have something to do with his height - freakishly tall...!). At the top of lake I was maybe only 90 seconds behind and as I passed the final aid station and the 1500m rowing course marker on the lake, Simon was approaching the 1000m marker. Somehow, I found another gear and never took my eyes off Simon. The gap was coming down with every step and with 400m to go I arrived just behind him. My plan was to sit in for 100m to recover and then go as hard as I could. He looked around at me the second I got there, my mind screamed and I had to go then. I opened my sprint, I had the gap but my legs were in agony however coming onto the red carpet the adrenaline took over, and I was floating. I couldn't hide my emotion, I looked back to make sure Simon hadn't rallied a another surge but I had the win for the second consecutive year as well as a new course record. A mere eight seconds later, Simon crossed the line and fell to floor - there is no doubt that he left everything on the road. To come so close to winning is hard, I had a similar battle with Scott Neyedli a few years ago and it's hard to take but he showed what a class act he is and was the first to congratulate me. I then learned that the title wasn't mine...yet. Joel Jameson had started in the second wave 10 minutes behind so I had to wait until 4:21:12 has passed on the race clock before I was sure, it was a nervous wait, not just for me but for Simon who had been pushed off the podium by Alex Foster in last years race. The time came and went and it was official, our own little Iron War was done and we had taken the top two steps. 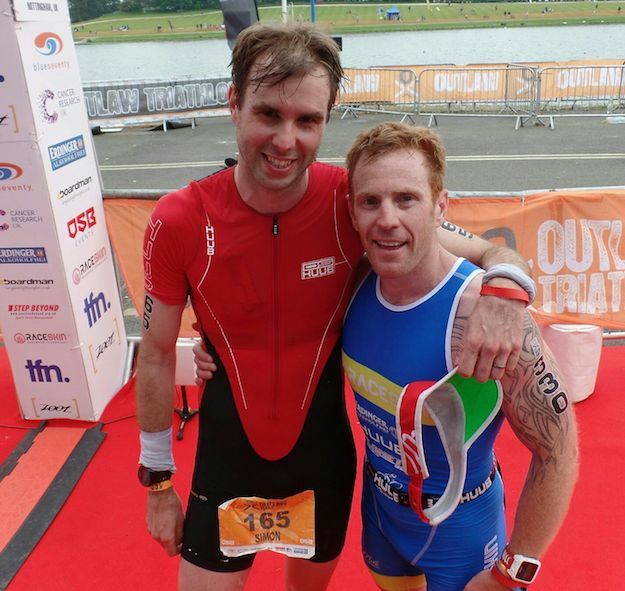 Thanks to OSB Events for yet another amazing event, each year this race gets better and better. 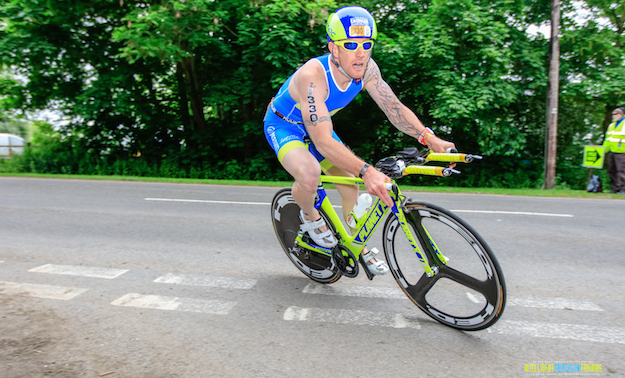 Thanks to my epic sponsors ERDINGER Alkoholfrei, Planet X bikes, HUUB and RaceSkin and of course to Simon George a ferocious competitor and true sportsman.